Cooking great tasting food is now even easier with the Bosch HMT75G451B in brushed steel, which combines multiple cooking options to help you out in the kitchen. 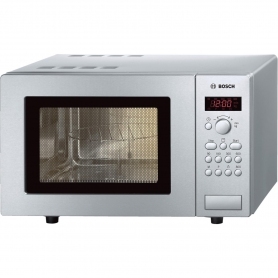 The HMT75G451B microwave has been designed with ease of use in mind. The control dial lets you precisely adjust the weight and cooking time, whilst a large digital display is easy to read. A handy electronic clock timer can even alert you when your food is finished. A side opening door and push button opening give you easy and instant access to your food, whilst an interior light lets you keep an eye on whatever is cooking. A grid comes included so you can start making great food as soon as you want. With a roomy 17 litre capacity, the HMT75G451B incorporates a powerful 1000 W grill function and microwave. The grill gives you even more cooking flexibility to create melted cheese toppings or crispy bacon with ease. 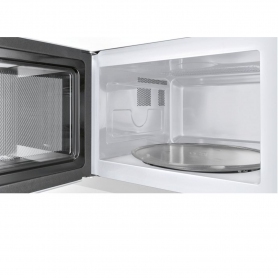 Choose between five microwave power levels, ranging from 90 W up to 800 W, to best suit your food type. No matter what you’re cooking, the HMT75G451B guarantees succulent and delicious food every time. A range of eight automatic programmes create the optimal cooking conditions for your food – just adjust the weight and food type, and let the microwave choose the correct time and temperature settings. Four defrost programmes are perfect for safely and quickly thawing out your food, whilst a memory function makes cooking your favourite meals even quicker by saving the settings for future use. The Bosch HMT75G451B combines a powerful grill function with a range of cooking programmes to create great tasting food every time. Buy yours today!